Thulium was discovered by Swedish chemist Per Teodor Cleve in 1879 when he was looking for impurities in samples of rare earth oxides. He isolated two new oxides, which eventually led to the identification and naming of the elements holmium and thulium. Thulium is named after Thule, Scandinavia. Despite being very rare and expensive, thulium has several commercial uses. Notably, it is used as a dopant for garnets used as laser gain media, and such lasers are used in medical laser applications such as laser surgery as well as in industrial and military applications. The radioactive isotope thulium-170 can be produced in nuclear reactors and is found in portable x-ray devices used for medical diagnostics and manufacturing quality-control applications. Additionally, this isotope can be used for radiotherapy cancer treatment. Other specialized roles for thulium exist or are under development. Notably, thulium may be used in high-temperature superconductors, magnetic ceramic materials, personal radiation dosimeters, and phosphors for use in anti-counterfeiting features of modern currency notes. Thulium is a rare earth element and can theoretically be found in any rare earth containing mineral, but as a heavy rare earth element (HREE) it is more common in HREE-enriched minerals such as xenotime and euxenite. Additionally, thulium is present in ion adsorption clays, which are a major source of HREEs due to their relative ease of processing, despite the low percentage quantities of rare earths they contain. In any source of rare earths, thulium will make up an extremely small percentage of the total rare earth content, as it is one of the rarest of the rare earth elements. Thulium emits blue light upon excitation, a property that is exploited in flat panel display screens. Thulium also has useful applications in low-levelradiation detection and other luminescence applications, such as halide discharge lamps. Flat panel screens depend critically on bright blue emitters. Thulium is available as metal and compounds with purities from 99% to 99.999% (ACS grade to ultra-high purity). Elemental or metallic forms include pellets, rod, wire and granules for evaporation source material purposes. Thulium oxide is available in powder and dense pellet form for such uses as optical coating and thin film applications. Oxides tend to be insoluble. Terbium fluorides is another insoluble form for uses in which oxygen is undesirable such as metallurgy, chemical and physical vapor deposition and in some optical coatings. Thulium is also available in soluble forms including chlorides, nitrates and acetates. These compounds can be manufactured as solutions at specified stoichiometries. Thulium is a Block F, Group 3, Period 6 element. The number of electrons in each of Thulium's shells is 2, 8, 18, 31, 8, 2 and its electronic configuration is [Xe]4f136s2. In its elemental form, CAS 7440-30-4, thulium has a silvery-white appearance. 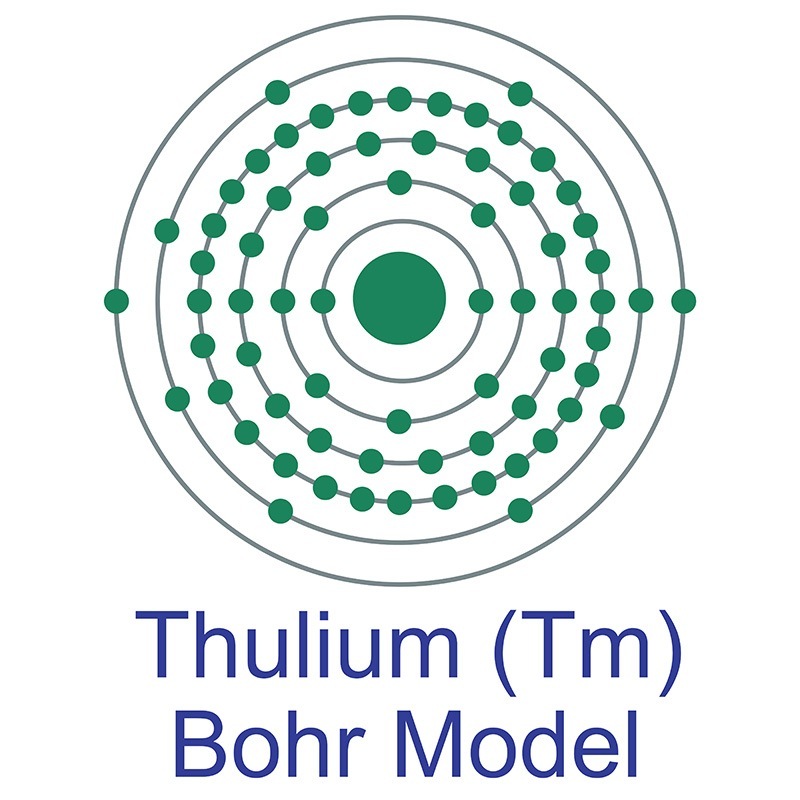 The thulium atom has a radius of 172.4.pm and its Van der Waals radius is unknown. Thulium is representative of the other lanthanides (rare earths) similar in chemistry to Yttrium. Thulium, first discovered by Theodore Cleve in 1879, is found in small quantities in minerals such as monazite. Thulium is named after "Thule", which is the ancient name of Scandinavia. Thulium is not toxic in its elemental form, however. safety data for Thulium and its compounds can vary widely depending on the form. For potential hazard information, toxicity, and road, sea and air transportation limitations, such as DOT Hazard Class, DOT Number, EU Number, NFPA Health rating and RTECS Class, please see the specific material or compound referenced in the Products tab. The below information applies to elemental (metallic) Thulium. Naturally occurring thulium (Tm) has 1 stable isotope, 169Tm.